History books call Oct. 24, 1929, “Black Thursday”. It was the beginning of the worst stock market crash ever experienced in the U.S. It also was the beginning of the Great Depression, the country’s longest, deepest and darkest economic period – an upheaval that lasted more than 10 years, not officially ending until the United States entered World War II. Black Thursday didn’t go unnoticed by D. W. Onan, his son, Bud, or their growing crew of workers at the Onan Company plant on Royalston Avenue near downtown Minneapolis. They heard reports of the stock market crash on the radio, and they saw the screaming, black headlines in the newspaper. But it wasn’t a particularly significant event to them. The Onans didn’t own shares of stock in any publicly owned corporation, although D. W. Onan had seriously considered buying some stock a few years earlier in a rapidly growing Minnesota company. The promising firm was Minnesota Mining and Manufacturing Company, later to be known as the 3M Co., and its stock was considered a bargain. Onan was tempted, but he needed his money for his own business. The Onans certainly couldn’t have known that Black Thursday was the beginning of a long decline in the country’s economy or that the next ten years would be the toughest in history for most U.S. businessmen. After all, 1929 was turning out to be an excellent year for the Onan Company, and, except for the nation’s farmers, the U.S. economy was booming. Sales of the new Onan generator sets were starting to take off with more than $50,000 in orders already received that year. Sales of the Onan “Safty Saw,” even though down from previous years, had brought in more than $100,000, and there was a smattering of sales of motor car tools and equipment. The Onans fully expected 1929 to be the best year ever with total sales to exceed $175,000. There wasn’t much reason to be concerned about “Black Thursday” at the Onan company. It wasn’t long, however, before the seriousness of the situation confronting all businesses in the country started to became apparent to D.W. and Bud Onan. On Nov. 2, a few days after “Black Thursday,” one of the leading businessmen in Minneapolis, Wilbur Foshay, who had just built the fabulous 32-story Foshay Tower in the center of downtown, went bankrupt. The Onans and other owners of small businesses began to worry a bit. If that can happen to a highly successful man, what does the future hold for those still struggling to survive? Farmers, who then represented the biggest potential market for the Onan generator sets, were among the first to feel the effects of the Great Depression. They already had been battered by the effects of several years of drought, and they had nothing in reserve to cope with further problems. From 1929 to 1932, the cash income of the nation’s farmers plunged by more than 75 percent. Wheat prices dropped from $1.21 a bushel in 1929 to 49 cents in 1932 and corn fell from 78 cents to 21 cents. Those farmers with a few spare dollars put a high priority on adding electricity to their places now that it was available with Onan generator sets, but many simply couldn’t scrape together the small amount of cash it took. As the domino effect of the depression took place, workers lost their jobs in industry after industry. More than 70 percent of the workers on the Minnesota Iron Range were without jobs by 1932. Across the country, there was an average of 100,000 people losing their jobs each week until the mid-1930s when the unemployment total reached 20 million, or 25 percent of the work force. During the trying years of the Great Depression, the Onan Company suffered less than most businesses, but times were far from easy. From the peak in 1929 when total revenues were $172,605, Onan sales fell during each of the next three years—$138,280 in 1930, $128,219 in 1931 and $111,980 in 1932. D.W. Onan was a firm believer that when a worker joined his company, he or she could expect 52 paychecks a year, and he was determined they shouldn’t have to worry day after day about losing their jobs. Onan himself did most of the worrying. There were many times when meeting the payroll was a very uncertain proposition, but he managed it each and every week. Both he and son Bud had to take pay cuts along with most of their 40 workers, but even during the darkest days of the depression everyone received a paycheck each week, and there is no record of anyone losing a job. There were times when the workweek was reduced to four days, and there were other times when there simply wasn’t enough for everyone to do, but the plant stayed open. Paychecks of $12 -to $15 a week seem paltry today, but back in the early 1930s that was the difference between standing in a bread line or living relatively comfortably. Homes could be rented for $15 to $20 a month, meat and other food items could be bought for pennies a pound, and a shirt cost only 25 cents. D.W. and Bud Onan spent much of their time in the first few years of the depression assuring their small crew that times would soon get better, and that at least they were assured of keeping their jobs. Things did get better for the Onan company, starting in 1933 when total sales for the year reached $114,280, only a couple thousand higher than the year before, but it was the first gain since 1929. In 1934, revenues reached $141,814, a healthy 24 percent increase over the year before. They jumped to $221,494 in 1935, $289,128 in 1936, $373,941 in 1937, $429,305 in 1939 and jumped past the half-million mark in 1939. As sales increased, additional workers were needed and the total payroll exceeded 60 people by 1939. It was during the 1930s that several key people were added – people who later became instrumental in much of the future growth of the Onan company. Tom Valenty, who went on to become president and chief executive officer before retiring in 1982, joined Onan on Aug. 3, 1936, when he was 16 years old, doing odd jobs. When the summer was over, Valenty went back to finish his last year of high school, but he continued to work part time at Onan, and after graduation, he resumed full—time duties. Valenty recalls that his parents could not afford to pay his college expenses, so if he were to go on to the University of Minnesota, as he had hoped, he would have to convince D. W. Onan to allow him to work part time for the next four years. Onan enthusiastically agreed, and in the fall of 1937 Valenty enrolled in the institute of Technology, working toward a degree in chemical engineering. Working as many hours as he could spare from his busy college schedule, Valenty put in some time practically every week day and often all day Saturday, Sunday and holidays at the Onan plant. When he first started at Onan, Valenty was paid 35 cents an hour, and by the time he received his bachelor’s degree in 1941, he was earning 75 cents an hour. “As graduation approached, I interviewed with a number of potential employers, finally accepting a position as engineering trainee with the Caterpillar Tractor Co. in Peoria, Illinois,” Valenty remembers. D. W. Onan was disappointed over the prospect of losing Valenty, and he argued as convincingly as he could that there was a good future for him at Onan, including a pay raise to $1 an hour. The real clincher, however, was the almost certain fact that the U.S. soon would be involved in World War II and Valenty probably would be drafted. He decided to stay in Minneapolis, working at Onan, until military service beckoned. Also joining the Onan company during the darkest days of the Great Depression was a 19-year-old aspiring engineer, Jim Hoiby. Hoiby started with Onan on April 13, 1934, becoming Chief Engineer at the start of World War II, and before he retired in 1977 he had advanced to vice president of the company’s Advanced Design and Planning Department. The Onan Company’s James C. Hoiby Technical Center in Minneapolis was named after him in recognition of the many valuable contributions he made over the years. But back in 1934 it was Hoiby who was the grateful one – ecstatic, in fact, over being able to find a job when such an accomplishment was mighty rare. Hoiby was a friend of Bud Onan, and Hoiby’s natural talents with mechanical and electrical gadgets were well known to Bud. [ Jim was Bud’s brother in law. ] Hoiby was in Long Beach, California, looking for work when the Onans decided they needed an engineer to help them develop some new generator products. Bud Onan sent Hoiby a telegram offering him a job, and Hoiby quickly accepted. While in high school, Hoiby was more interested in tinkering with machinery than he was in reading the classics or studying geography. His father owned an automotive repair shop, and Jim had ready access to tools he needed for his hobbies. When he was 16, Hoiby designed a two-cylinder engine in the drafting department of his high school. He made the patterns in the school’s wood working shop, machined the castings in the school’s machine shop and then assembled it in his father’s garage. The engine was used to power a propeller-driven ice boat. Hoiby also was interested in electrical gadgets, building radio receivers and transmitters with rudimentary tools and test equipment. When he joined Onan, he was elated over having good electrical equipment at his disposal. He was especially impressed with Onan’s cathode ray oscillograph, one of the first ever marketed. His first assignment at Onan was working in the machine shop under Steen Ecklund, making parts for the company’s first engine for its own generator sets. Then he was given a drafting table in the old house on Royalston next to the manufacturing plant that had been added. It also was during the depression that another Onan family member joined the company. Bob Onan, the younger brother of Bud, came aboard in 1933, spending all of his business career with the family-owned concern. Unlike his brother, who had all the traits of his father, Bob Onan was not especially mechanically inclined. His strong points were with working out people problems. During his nearly 30 years with the company. Bob served as personnel director, the public relations representative and in various other administrative capacities. One thing all three Onans had in common was a deep concern for the community in which they lived and for their families. Although busy in running the company, all three found more than enough time to devote to civic activities and to family affairs. D. W. Onan was especially active in the Optimists International organization, serving as District Governor, International Vice President and in 1932 being elected Optimists International President at the convention in San Francisco. He also served as president of the Minneapolis Civic and Commerce Association and was active in many community projects throughout the years. Both sons likewise showed intense interest in civic activities. Their involvement in community problems probably had much to do with the fact that the Onan Company was relatively successful in the depression years when so many other businesses around them failed. Not that the Onans breezed through those rough years of the 1930s, but the company never was in serious danger of going bankrupt. The closest Onan came to a financial crisis was in 1933 when the company had extremely tight cash flow. D. W. Onan hoped to correct the problem with help from bankers, but he was flatly turned down. He had much better success, however, with his suppliers. He approached them with an honest assessment of his problems, and within 10 days persuaded them to extend the Onan Company $30,000 worth of credit. From the beginning, D. W. Onan’s philosophy was to treat suppliers, customers and employees with the same respect and honesty he hoped they would show him. When his suppliers cams through with the badly needed credit, he knew his philosophy was right. Onan also didn’t forget the favor. In future years there were many opportunities to change certain suppliers for promises of a better price or faster service, but Onan refused to drop any of the suppliers who had helped him out in 1933. Survival of the Onan company during the Great Depression can be attributed to many reasons, none more important, though, than the great flexibility of the young firm. Every time a problem arose—and there were many of them during the 1930s—the Onans quickly figured a way around it, often not only neatly solving the dilemma at hand but opening up huge new opportunities for the future. When it became obvious there was a tremendous market for Onan generator sets, it also became obvious the engines and generators being purchased would not do the job required. The Onans solved the problem by designing both their own generators and engines. Once they had their own engineering capabilities, they were able to constantly modify and improve their products, vastly increasing their sales potential. The stickiest problem of the 1930s was caused by the U.S. government. With Onan generator sets finding wide acceptance in rural areas of America, it appeared the huge market would keep things humming at the Onan plant for many years. Then the REA (Rural Electrification Administration) spoiled that prospect as electric power from central utilities became commonplace among farmers. Instead of bewailing this development, the Onans quickly turned to foreign markets where electric power was available only in larger cities, with little prospect rural areas there would be seeing any REA type project. Export trade was a rarity for small companies back in the 1930s, but the Onans didn’t worry about the complexities. There was a huge market overseas and the Onan company had a product in demand. To D. W. Onan and his sons, it merely was a simple case of matching demand with supply. There were no expensive foreign junkets to hunt out prospects. The Onans just increased their small ads in publications that were read in lesser developed countries, did more direct mail promotion to those areas, and relied on word-of-mouth referrals from satisfied customers. Within a few short years, Onan generator sets were to be found in 49 foreign countries. By 1936, foreign sales were exceeding domestic sales. Customers included satisfied plantation owners in Jamaica, natives in Nigeria, rice farmers in China, jukebox operators in Mexico, fishing boat operators in New Caledonia, oil drillers in Venezuela and jungle dwellers in the Philippines—all using, and praising, Onan generator sets. There were no complicated foreign exchange problems involved. The Onan Company asked for, and received, U.S. dollars, usually in advance. Orders were small but plentiful. The simple approach was sought whenever possible. For instance, the Onans received a $105 order from an individual in Alaska. The freight bill on the order would have been $96. So the Onans sent it by parcel post. The cost was $17. There was no end to the applications for an Onan generator set. A promotion piece used by the company in 1937 stated, “Ideal for operating radios, portable sound and public address systems, remote radio transmitters, private communications systems, neon signs, motion picture equipment, portable medical and dental clinics, geologist instruments, assayer equipment, sales demonstration trailers, portable saws, flood lights and floor sanders. ” The wide variety of uses for the generator sets meant the company needed a product line that would meet all of these different demands. 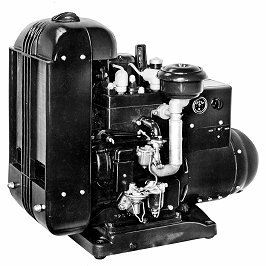 From a single 350-watt unit, the Onan generator set line quickly offered 1,500- and 2,000-watt models, then modified the equipment until by the late 1930s there were units in the 20,000-watt category. 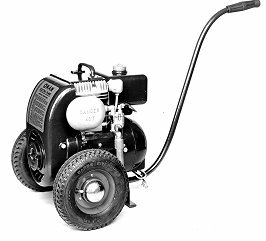 The convenience of remote electric starting of the generator sets was introduced in 1935. By 1939 the Onans were certain their small business was firmly established and they anticipated steady, but moderate, growth for many years. They couldn’t have dreamed, however, of what World War II would do to their plans.